1. Min Yoon-gi was born on March 9, 1993, in Daegu, 300 kilometers southeast of Seoul. 2. He is the lead rapper of BTS. 4. 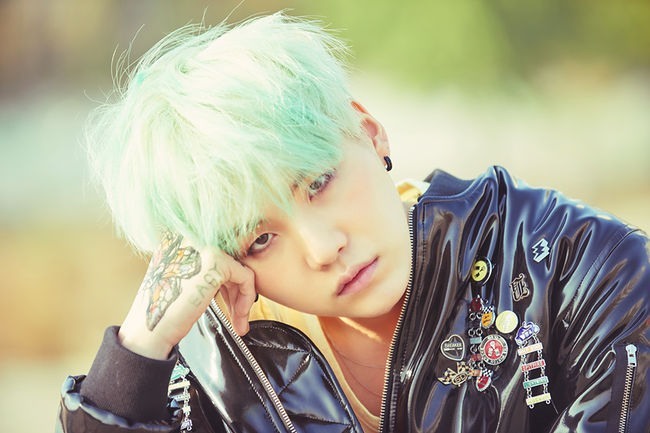 Prior to joining Big Hit Entertainment, Suga used to be an underground rapper with the stage name Gloss. 5. In 2010, when he was part of the hip-hop crew D-Town, he produced the song “518-062” in commemoration of the Gwangju Uprising. 6. He originally joined Big Hit as a producer, not an idol. 7. When forming BTS, Big Hit CEO Bang Si-hyuk told Suga that he didn’t have to dance and all he had to do was rap. Suga later joked that he was “deceived” by Bang. 8. Suga won second place at the “Hit It” rap audition held by Big Hit Entertainment in 2010. 9. He began writing songs and working with synthesizers at the age of 13. By the time he was 17, he had worked a part-time job at a recording studio to learn about producing. “There was no special motivation for making music. I just had to do it,” he said. 10. Despite his love for music, he disliked studying music with textbooks at school. 11. Although he did various part-time jobs while studying music in Daegu, it was hard for him to afford expenses for food and transportation. When he was in high school, he earned pocket money by arranging a school song. 12. He used to wear braces. 13. Suga has a driver’s license. 15. 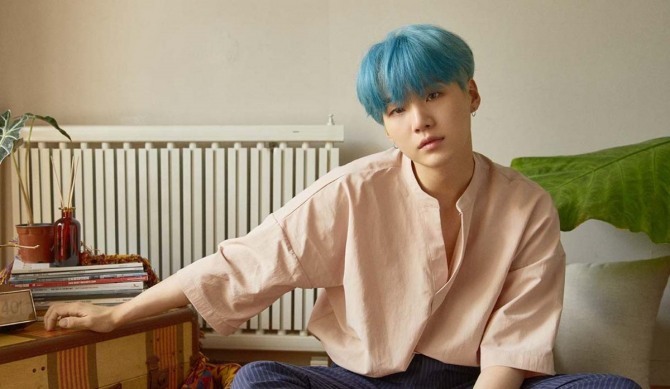 In his self-made song “140505 at Dawn,” Suga reveals that he had suffered from mental problems, such as social phobia, depression and obsession. 16. Suga loves basketball. He used to play basketball a lot as a student, and when he was a trainee, he played it every Sunday. His position was usually point guard or shooting guard. 17. Due to his love for basketball, Suga had believed he would grow to a height of over 180 centimeters. However, after injuring his shoulders in a motorcycle accident prior to his debut, he couldn’t exercise as much as before. He was carrying out a delivery at the time of the accident. 18. He doesn’t like dancing despite being good at it. Other dislikes include loud and crowded places. 19. He learned how to play the piano by himself. 20. His blood type is O. 21. Suga loves taking photos. He currently majors in photography at Global Cyber University. 22. 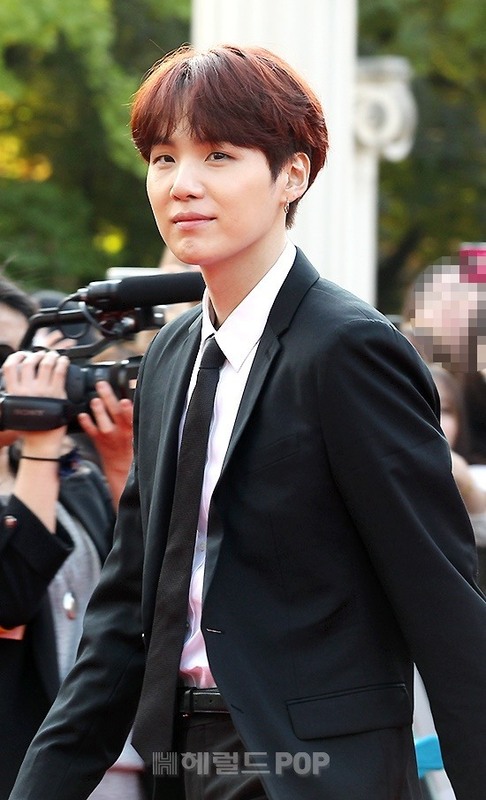 All kinds of hair color suit Suga because of his pale skin tone. 23. Suga may not look very affectionate at first, as he is quite taciturn and doesn’t smile much. 24. 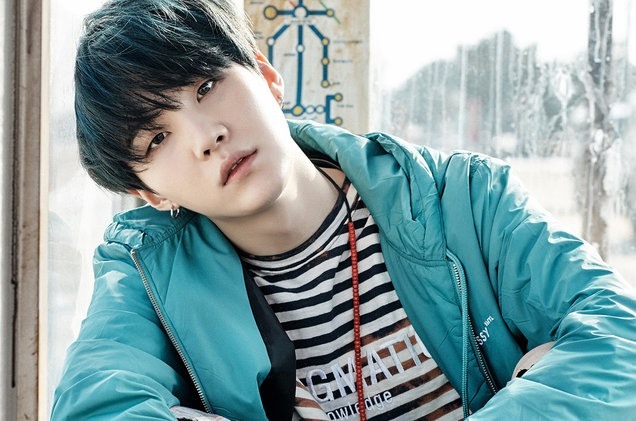 Suga is the calmest member of the group. When BTS was featured on Jimmy Fallon’s “Tonight Show,” he managed to sit still on the couch while the rest of the group danced and jumped around with Fallon. 25. Due to his straightforward and realistic personality, some of his mixtape songs contain hard-hitting words and critical lines. 26. According to J-Hope, he is one of the most caring members in BTS. 27. Suga prefers staying indoors to going out. According to his bandmates, he loves sleeping and lying down; the only places he frequents are the studio, dorm and broadcasting station. 28. Once he holes up in a studio, he rarely goes out; he literally “lives” in it. 29. 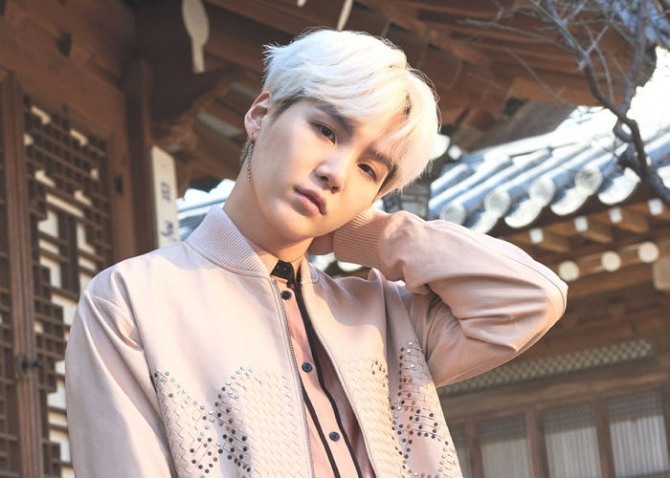 Although he isn’t an outgoing person, Suga has many celebrity friends, including Super Junior’s Heechul, GOT7’s JB, Wanna One’s Kang Daniel, Suran and Epik High’s Tablo. 30. He lent his voice and wrote the rap part for Lee So-ra’s “Song Request,” crafted by Tablo. 31. He chose Jimin as the member he would like to bring along if he had to live on a desert island for three years. 32. He wouldn’t get involved in gambling and stocks. 33. He is in charge of admonishing and educating younger members. 34. He has an older brother, with whom he shares everything. In his mixtape “Skit,” Suga says his brother enabled him to do music as he trusted in Suga. 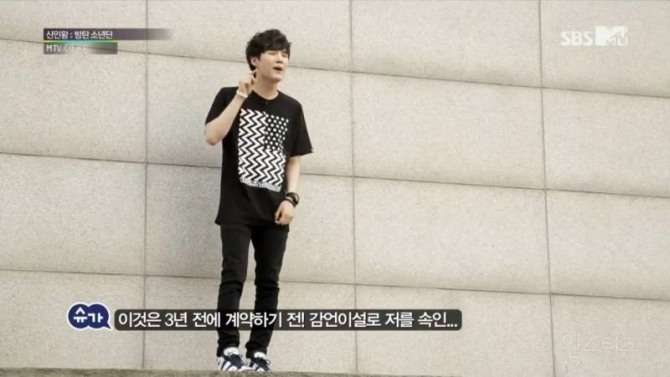 His brother was the first person Suga had reached out to after passing the audition for Big Hit. 35. He feels happiest when working in a studio. 36. Suga has a habit of biting his nails. 38. Although he does not have a tattoo, if he got one, it would be a small dot on his toe. He hopes to do charitable works in the future and is afraid that tattoos could be viewed negatively. 39. Even in summer, he often wears long-sleeved shirts because he doesn’t like exposing his skin to the sun. 40. 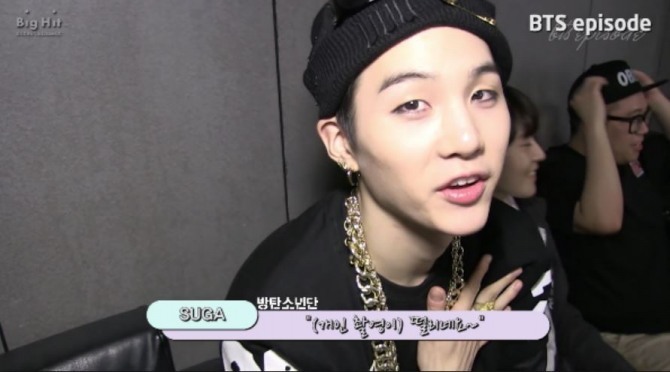 Suga’s ideal woman is one who listens to hip-hop and is calm and understanding -- as he is a bit short-tampered. He prioritizes personality over appearances. 41. He had a girlfriend before his debut, but they broke up after he became a trainee. 42. His favorite Hollywood star is Scarlett Johansson. 43. As a child, he wanted to become an architect. 44. 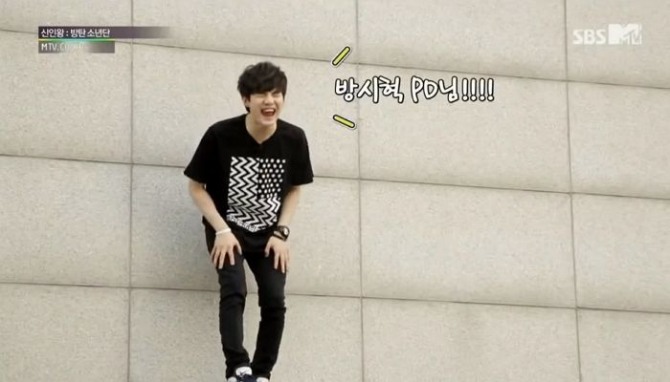 Suga likened himself to a cat because he likes to be alone and doesn’t mingle easily with others. 45. Suga has a brown poodle named Holly, and he loves taking selfies with him. 46. The first album he purchased was one by Eminem. 47. The first thing he puts in his luggage is his laptop so that he can make music whenever and wherever he wants. 49. Suga’s favorite color is white.